Dr. Clark is Chair of Research, Department of Psychiatry and Psychology and Professor of Psychology, Mayo Clinic. Dr. Clark has been involved in documenting outcomes related to stress management programs at the DAHLC. 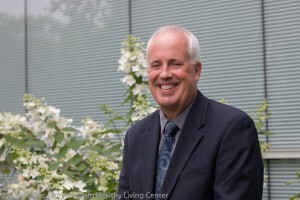 He published a paper in The American Journal of Health Promotion that found a relationship between high stress level and quality of life, weight, energy and health behaviors in over 13,000 DAHLC members. He was involved in two papers, both published in Stress and Health that showed that participants in our 12 week Stress Less Program and our 12 week Ride-it-Out Program experienced a reduction in their stress levels, and this improvement was maintained over time. Recently he published a paper in The American Journal of Health Promotion that reported that usage of the DAHLC was associated with improvements in quality of life. He has also helped examine our wellness coaching program, and a paper published in The American Journal of Health Behaviors demonstrated that DAHLC members experience improvements in their motivation for healthy living after participating in our wellness coaching program. A recent paper published in Mayo Clinic Proceedings demonstrated that our wellness coaching program improves the participants quality of life, mood and stress level. Dr. Clark’s research has focused on the implementation of behavioral interventions to improve adherence to health behavior change recommendations in medical patients and on strategies for helping patients cope with their health problems. He is involved in several NIH funded research projects which are examining obesity treatment outcomes, nicotine dependence treatment, resiliency strategies, and physical activity interventions. Dr. Clark is also the primary investigator on a four-year study which is examining the potential effectiveness of a structured multidisciplinary intervention on improving the quality of life of cancer patients and their family members.